If you only live once—the members of Once Around are finding a way to make every moment count. 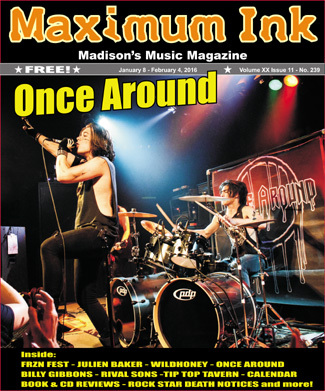 But before you assume this Madison-based band is a bunch of road-hardened veterans, you may be surprised to learn this group is made up of driven, talented… teenagers. So what’s really making their young lust for life stand out in a big way? 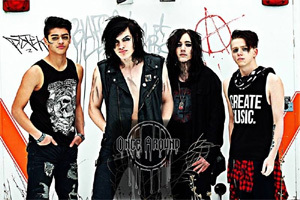 Once Around creatively combines its own style of original old school rock and glam, with some new age metal and punk. Sebastian Sikk is the 17-year-old lead vocalist; Wrath Starz is 16, and plays lead guitar, rhythm guitar, and contributes to backing vocals. 19-year-old Bam joins on bass, and backing vocals; then there’s Chase, who is 16, on drums. But don’t let their ages fool you. Laura talked with Once Around as the band gets ready to release some new music during its February 5th show at The Red Zone in Madison. Maximum Ink: Once Around is a clever name. How did you come up with it, and are you using it as (almost) a motto for the band? Sebastian Sikk: The significance behind it, and a lot of our song lyrics is that you only live once, and a band like this only comes around once. The music is our message, and it just feels like it has been all the same old radio rock for awhile. I feel like there hasn’t been a new band to come out and skyrocket in popularity since Black Veil Brides. So we are trying to do something different, combining new age with older music we grew up on like Skid Row, Poison, and KISS. But we are mixing it up, and creating something new, along with a unique look. And not many people are doing a look anymore. MI: You’ve already had some success. What do you think about the attention you’ve received in a relatively short amount of time? Bam: I think we’ve progressed a lot faster than most bands in just a year and a half. We’ve opened for nationally recognized groups like Powerman 5000, Bobaflex, Like A Storm, and Trapt. Wrath Starz: Our current EP has three songs we recorded with Paul Schluter at Megatone Studios in Madison. That is what caught people’s attention. Sebastian: We are happy with what we’ve accomplished so far, and even our first single “Insane” was played on The Rock 97.3 out of Dubuque, Iowa. Not many bands make it on the radio, let alone with their first single! But now it’s a matter of taking the next step. MI: The band will headline its first show, and have three opening acts at The Red Zone in February, which is great. Though you don’t have other jobs right now, is it tough to balance your time with school? Sebastian: You can’t really turn down a lot of shows. You have to get yourself out there. You can’t go back either. So something like college you can do at any age, but when you are in a band you may not get another chance. You have to do whatever you can now. MI: Is Once Around starting to set some future goals? Sebastian: Expanding our territory, and increasing our audience is a key part of our long range goals. We want to keep playing on a regular basis, and we’re working on more moves, more lights, new songs. It will be a whole different set list than what everyone has heard so far. We also have a new look which will be diffferent. Chase: We’re doing that to show how we’re different, and taking another step to show what we stand for as a band. Other groups might wear ripped jeans and vests, but we’re trying to create a whole style that matches our characters, similar to KISS. Sebastian: And we’re working with our manager on a summer tour. We know if you keep playing the same shows you aren’t going to get the additional exposure you need, and you may end up getting stuck. So we’re currently working to contract a tour to cover 22 dates in July, and would include a few other national and international acts along with us.